For most Ivy League schools, acceptance rates have declined each year over the past four years. The College has already changed its admissions strategies with regards to expanding outreach to underrepresented geographic areas. Coffin said that the admissions office has redistricted Florida and California to allow for smaller recruitment areas. For example, Coffin noted that more than five admissions officers are dedicated to California alone. He explained that more officers are necessary because in the West, the South and abroad, admissions officers often need to explain what a liberal arts college is before they can talk about Dartmouth. According to Coffin, admissions officers embrace a situation-specific approach in order to best inform the students at the school an officer is visiting. For example, before an officer visits a specific school, they read a file detailing the school’s academics and that includes information such as how many students go to a four-year college after graduation. If a student applies from a school that does not typically send graduates to small, liberal arts colleges, the admissions office also takes it into account, Coffin said. The College is already witnessing a change in admissions trends because of this policy, Coffin said. To demonstrate this change, Coffin noted that only 14 percent of students at Dartmouth come from New England. Coffin also discussed reasons why the admissions process may change in the near future, including the affirmative action lawsuit against Harvard. The 2014 suit alleged that Harvard discriminated against Asian American applicants on the basis of their ethnicity. Coffin added that it would be more difficult to create a community without a holistic application process. “That, to me, would be the worst possible outcome of this,” he said. Coffin also stated that, despite recent trends, the admissions rates of top colleges may not continue to decline. 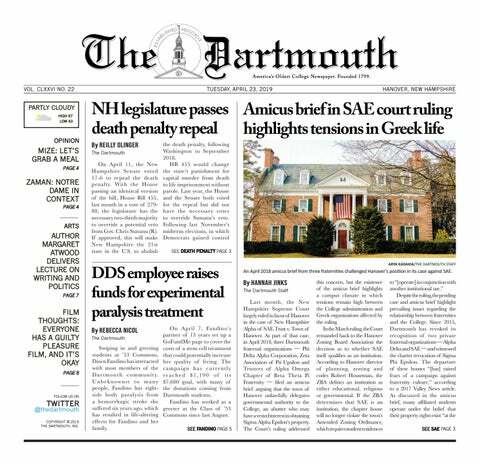 Past admissions rates indicate a steady decline in the admissions rates of top universities, including Dartmouth. For Dartmouth’s Class of 2023, the acceptance rate decreased by 0.8 percent from 8.7 percent accepted for the Class of 2022. The College’s acceptance rate has followed this decreasing pattern over the past three admissions cycles. In 2017, 10.4 percent of applicants were accepted for the Class of 2021, while 10.5 percent were accepted in 2016 for the Class of 2020. This decline in admissions rate is mirrored in the rates of other top universities. Since 2016, Brown University, Columbia University, Harvard and the University of Pennsylvania have consistently accepted a lower percentage of applicants each year. Cornell University, Princeton University and Yale University have generally seen a lower acceptance rate with each year with a few exceptions. This year, Harvard saw the lowest acceptance rate in the Ivy League with 4.5 percent of their applicants accepted. Cornell accepted the highest percentage of students with a 10.6 percent acceptance rate. Columbia, Princeton, Yale, Brown, and Penn had acceptance rates of 5.1 percent, 5.8 percent, 5.9 percent, 6.6 percent, and 7.4 percent, respectively. For many students, the steady decrease in admissions rates represents an ongoing trend that has both positive and negative effects. However, Coffin noted that this decrease will not continue to occur as a constant. For example, Coffin noted that a possible change in international relations could affect admissions numbers by drastically changing the size of the international admissions pool. However, Coffin said that he did not believe such shifts would occur soon. Instead, he is focused on Dartmouth’s changing admissions strategy, which focuses on factors like socioeconomic diversity. Furthermore, the admissions office is now focused on increasing yield when choosing applicants, which the office often achieves by using complex models that examine different variables. He added that two of the variables considered were geography and academic credentials. For example, Coffin noted that these models demonstrate that a student from Florida is less likely to enroll than a student from New Hampshire. Despite the changes in admissions strategies, one constant that remains is the feeling experienced by students when they receive admission into the College and visit Hanover. For example, Alison Ingalls was one of the 1,876 students accepted to the College last month. The day after receiving her acceptance notification, she drove down to the campus for a weekend visit and has already decided that she will be attending Dartmouth in the fall. “Just seeing the social scene, but also just the vibe on campus and being able to experience that as an accepted student — the idea that could all be my reality next year was really cool,” she said.